Damnable Bay as a place-name first appears in printed form on the Bonavista Bay chart of Holbrook in 1816. It was probably named for bothersome navigational conditions in the days of sailing vessels. Other explanations prevail in local folklore. The name, for example, is often pronounced as "Damn the Bell". "Damnable" is usually the written version, though a few sources used the name "Dangerous Bay". The head of the bay contains a comfortably sheltered cove within an area which was once well-timbered, a good place where a few families from Salvage (Hunter, Martin/Crisby, Troke) once overwintered and eventually settled. They were later joined by families from Sailors Island (Lane, Moss), Wild Cove (Rogers) and Flat Island (Hiscock). The shore side of the cove is rather rocky and rugged, containing only a few small terraces, gentle slopes and hollows suitable for dwellings and gardens. The relief and physical limitations severely restricted the size of settlement. The name Damnable was changed in the late 1890s to the more pious St. Chad's at the behest of the Reverend T.M. Wilson. St. Chad's, formerly Damnable, is a secure harbour but has a tricky (some might say "dangerous" or "damnable") approach and entrance. Photo by Gordon Handcock, ©1986. Reproduced by permission of Gordon Handcock. "My grandfather was the first man to come to live here. They lived there in the bottom of the cove ... They had a studded house built like the old people use to have fore now. Well, they lived in her for winter and summer for I don't know how many years. And then they started and built a house here...". Hunter related that St. Chad's was then a veritable forest with plenty of timber and firewood but that "about 66 or 67 years ago" the place was burned out with only two houses saved. This was, of course, the same forest fire that ravaged Squid Tickle and Halides Cove in May 1912, an event that was later commemorated in the name Burnside. The fire effectively destroyed the wood resources around these communities. In its aftermath some moved away to places such as Grand Falls. 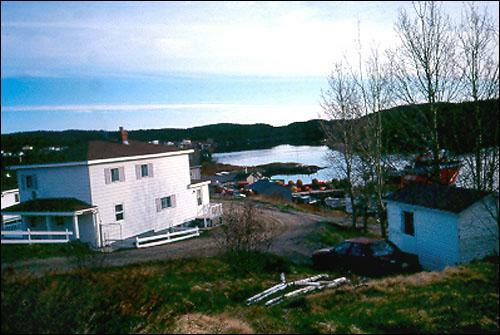 Those who remained relied upon the inshore and Labrador fisheries and supplemented these activities by going to the spring seal hunt or logging away from home. 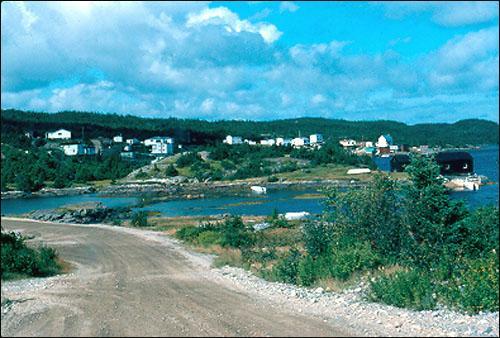 William Martin, for example, the principal local entrepreneur, operated a sawmill at Broad Cove in Newman Sound after the fire and also sent a schooner to Labrador. After the fire of 1912 destroyed most of St. Chad's, those people who stayed relied upon the fisheries for income. According to Burden merchant ledgers of the 1880s and 1890s, dealers such as Thomas Hunter and John Martin of Damnable and the Hunters (James Sr. & Jr., Joseph and John) of Halletts Cove relied much on wood products (such as bundles of hoops and birch rind, wharf sticks, fire wood, flake longers and railway sleepers) to settle their accounts for food and supplies. Evidently the Burdens acquired a contract to supply wood materials ties during the construction of the Newfoundland Railway. The opportunity to cut railway ties may have been a major reason why both St. Chad's and Burnside attracted families into permanent residence in this period. These same families, however, continued to operate in the fishery during the summer months and most continued to regard themselves primarily as fishermen. By the 1950s a large proportion of the male labour force of St. Chad's and Burnside were engaging as carpenters in construction around the province. In recent decades Burnside and St. Chad's have been favoured more as places for maintaining second homes and holiday cottages by erstwhile urban dwellers rather than by young couples to raise families. In consequence both have experienced population decline. Burnside's association with archaeological research and interpretation of Aboriginal sites in and around Bloody Reach (the Cowpath) has given this community a new cultural and heritage dimension of some valuable consequence.